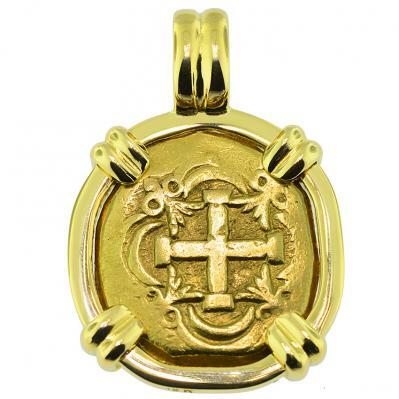 This is a genuine Spanish gold coin that was minted in the "New Spain" city of Bogota in 1722 - 1732. Santa Fé de Bogotá was founded by the Spanish in 1538 and the mint opened in 1622. The majority of gold coins minted in the "New World" were struck in Bogota. This 2 escudos was minted during the reign of King Philip V, who was the first member of the French House of Bourbon to rule as King of Spain. The obverse of this coin features a cross with crowns in the quarters all within a quatrefoil and the reverse depicts the Philip V coat of arms. With the discovery of untold riches that were mined in the Americas, the Spanish became the premier supplier of gold and silver coins for the world. This vastly increased trade and made many merchants wealthy, both in Spain and in the Colonies. However, during this adventurous age, it was inevitable that large amounts of Spanish treasure would be lost on land and at sea due to pirates, storms and other unforeseen misfortunes. Gold coinage of this historical period was decreed by the King to be 22 karats and were hand stuck from dies and cut to weight according to the Spanish monetary system. 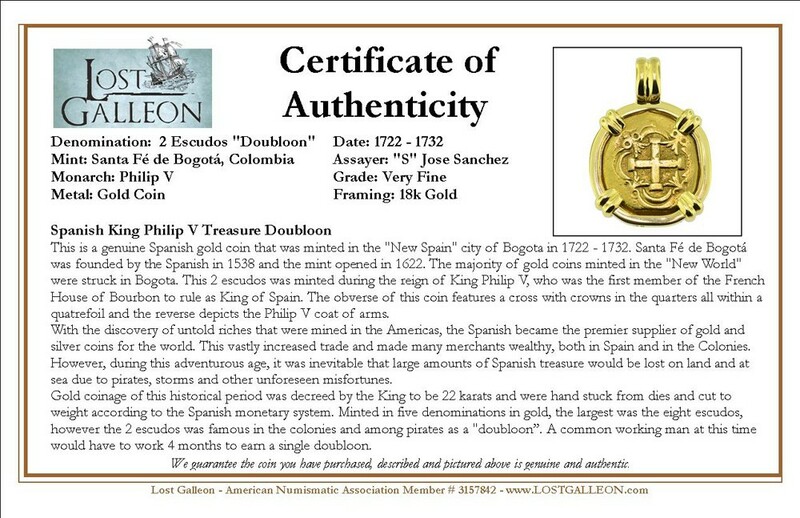 Minted in five denominations in gold, the largest was the eight escudos, however the 2 escudos was famous in the colonies and among pirates as a "doubloon”. 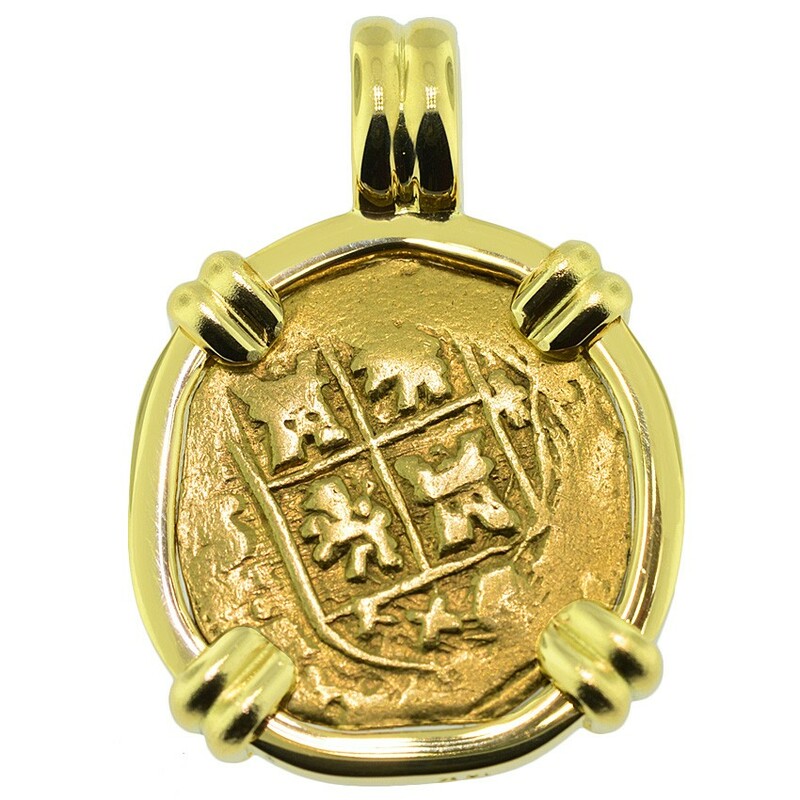 A common working man at this time would have to work 4 months to earn a single doubloon.